The Mariners have an excess shortstop, with Nick Franklin and Brad Miller.PORT ST. LUCIE, Fla. -- Assuming Stephen Drew ends up elsewhere, and that is the likelihood as far as Mets brass is concerned, there does appear to be a viable shortstop trade option for the club with the Seattle Mariners, according to industry insiders. 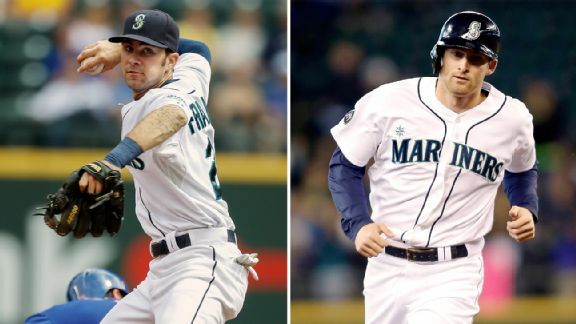 The Mariners are likely to trade Nick Franklin or Brad Miller -- most likely Franklin -- before Opening Day. And that should be considered an upgrade over Ruben Tejada for the Mets. Franklin, who turns 23 on March 2, hit .225 with 12 homers, 45 RBIs and six steals in 369 at-bats as a rookie last season while appearing in 96 games at second base and three games at shortstop. He now has been dislodged from second base in Seattle with the signing of Robinson Cano. Miller's success last season as a rookie shortstop (.265, 8 HR, 36 RBIs in 306 at-bats) means one player is expendable. "Shortstop's really my natural position," Franklin told the Seattle Times. "Being at second was a little outside of it. The big thing with me, I grew up playing shortstop my whole life. It's nothing new to me."